Not the most dramatic Maui waterfall, but fun to swim in nonetheless! In a nutshell: CLOSED. 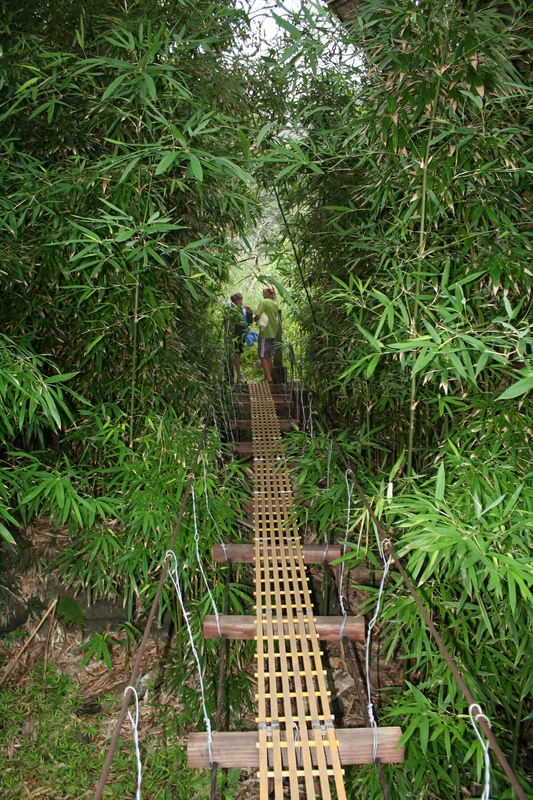 Hike into windward West Maui Mountains across suspension bridges, small waterfalls and end at a pool. A strong razor-wire lined gate has been placed on the trail/access road. Sorry, it is actually a very sore spot among native Hawaiians, residents and visitors alike, but no one can go here any more. More information in this excellent Maui Time article. 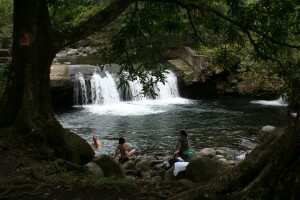 This is an interesting hike, and many local families love to come here with their keiki. Kids love crossing the swinging suspension bridges and the end of the hike has a man-made concrete diversion dam and waterfall that cascades into a refreshing swimming hole. The valley is peaceful and beautiful, with some side treks into absolutely magical forest possible. That said, I’m going to have to say that this is a better option for residents because most visitors have limited time and there are better (and many more) options for waterfall and jungle hikes along the Road to Hana. One of the swinging bridges. Consider Swinging Bridges if you live here and are looking for something new, or if find yourself around West Maui’s North Shore ahead of schedule. I personally prefer the hike just a mile away which is along the ridge of this valley: Waihee Ridge Trail. You can pick based on your taste and ability – the ridge hike has sweeping views, but no water and is also more strenuous. A note in getting here: Around mile marker 4.9 is Wahe’e Valley Rd, turn onto the road and follow looking for singes for Waihe’e Valley Plantation. Pull in, pay and park. Mile Marker: #4.9 (Kahekili Hwy aka Hwy 340), turn onto Waihe’e Valley Rd. Me and my boyfriend hiked this trail today. It was insane. Very strenuous. Only for advanced hikers. Definitely not for families with kids. Word of advise: make sure you pack plenty of water, a bug spray, and good sturdy water shoes as you will be walking though mud. There are two pretty cool suspension bridges on the trail. Even though they were probably not inspected since the trail closed back in 2011, they look pretty sturdy and all the wiring remains intact. However, be advised that the stairs leading up to them are beaten up. In some places, the concrete has fallen off. There is also a high risk of the rocks falling off from the cliffs above the trail. Make sure you watch for that as you probably do want to come out of this trail alive… The trail leads through a bamboo forest. It was beautiful. There is also a lot of exotic flowers on the trail. We noticed some banana trees on our way as well. The trail ends at a small, man made waterfall. The whole idea behind us taking this trail was not the suspension bridges (although they were very cool) but to reach the Honokahau Falls (as filmed here: https://www.youtube.com/watch?v=8T80XMWdd9Q) which everyone says are inaccessible by trail. We took our chances and followed the river upstream. All together we hiked about 5 hours one way, for a total of 10 hours. We ended up coming up very close to Honokohau Falls, however because it was already 1:30 PM, we decided to turn back as we didn’t want to come back at nightfall. Maybe if we followed all the way though the stream, we would finally come to the spot where the waterfall collapses… The route upstream is extremely dangerous. Easy to slip and break a leg. Considering everything I wouldn’t recommend hiking this way. The falls are beautiful, but still not worth the effort. Take the helicopter instead. Unfortunately, it is still closed. Waihee Ridge Trail (http://mauiguidebook.com/adventures/waihee-ridge-trail/)is just above this valley, and is a nice hike but no water. If you want waterfalls, Road to Hana has countless options. Aloha! My girlfriend and I hiked it today…. It is great. Caught one of the Waihee Valley Plantation gentlemen at the gate and invited us to come take a look at the plantation. What an awesome thing they are doing. We walked the paved road and finally hit the large black fence with razor wire atop and around it. You can get around the gate, but it is a sheer drop off. It is well worth it. 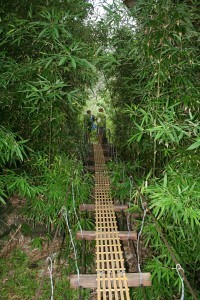 The two swinging bridges are awesome and we kept on going along a path that is a path, however seldom used. We didn’t make it to a waterfall, crossing through the stream 3-4 times. After that the foliage which was already extreme got even more extreme we decided to turn around. Overall a great hike and we only saw 2 other people on the trail. They were leaving as we were entering. in Jan 2013, we visited Maui and hiked this trail. we heard from Bull frogs guide that it was “recently reopened” so we took a chance. we had v young kids 3 and 5 yrs old but reviews that its a ‘family hike’ prompted us to go for it. its a challenge. by way of some lucky encounters and goodwill by chance, we found the diversion route. its very dangerous steep down hill for young ones or anyone not used to slippery, muddy, bashing through the vegetation type of ‘hike’…..+ mosquitoes attack in the thick foliage. on the way back, instead of the long diversion, we decided to risk the razor wire. possible but very dangerous! if you are young, do high risk sports, good at hiking (off road) in the wilderness, you would think this is thrilling. what we did was absolutely crazy. we dont encourage families but its such a fun hike that tourism board really should do something to this closure. its too selfish for whatever proprietor reasons to shut this from the rest of the world. Where is the diversion route? When it will be re-openned?